This textbook introduction to the basic elements of fundamental astronomy and astrophysics serves as a foundation for understanding the structure, evolution, and observed properties of stars. The first half of the book explains how stellar motions, distances, luminosities, colors, radii, masses and temperatures are measured or derived. The author then shows how data of these sorts can be arranged to classify stars through their spectra. Stellar rotation and stellar magnetic fields are introduced. Stars with peculiar spectra and pulsating stars also merit special attention. The endpoints of stellar evolutions are briefly described. There is a separate chapter on the Sun and a final one on interstellar absorption. The usefulness of this text is enhanced by the inclusion of problems for students, tables of astronomical constants, and a selective bibliography. 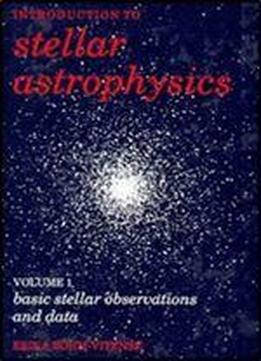 This is an excellent textbook for undergraduate and beginning graduate students studying astronomy and astrophysics.